Happy Monday!!! ToI hope you all enjoyed your weekend! Today's card is a baby card! I used the quilting technique along with my Postage Punch to help resemble the "squares" in the quilt. 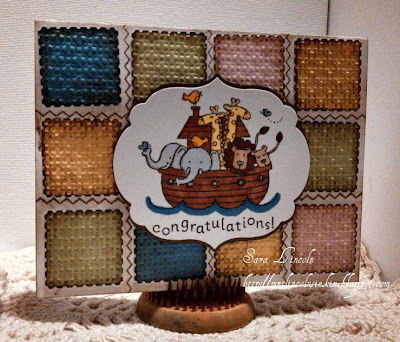 I outlined the squares with a stamp from the Patterned Boarders set from TPC Studio in Brown Memento Ink. Once that was done, i didn't like all the White that you could see, i wanted it to look more aged so i took a sponge and a lite coat of Soft Suede ink and ran my sponge over the entire background. This i think helped a lot!!! Aren't the animals just so cute? I just love it!! I used a few of my Copic markers to color in the image and cut it out using my Framelit Label Dies. To back my image, i used the same size "frame" that i used to cut my image out, cut it in half and then snailed it on the back to give it a nice boarder.